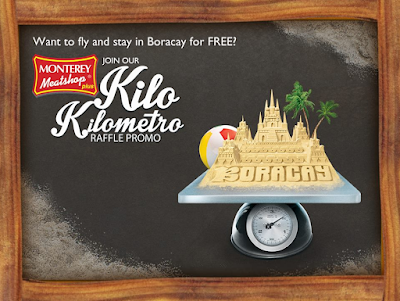 Girl Kuripot Girl Kuripot: @Monterey_Meats, Win a Trip for 3 to Boracay! This is a chance to win a 3D2N trip for 3 to Boracay! Every P100 worth of pork, beef or chicken at Monterey Meatshops entitles you to a raffle entry. You have until October 31, 2015! Click here for more info on the Monterey Meatshop Kilo Kilometro Raffle Promo.